More about Marimekko Red Unikko Long Polyester Shower Curtain These fun shower curtains by Marimekko are in the popular Unikko pattern. Add a little bit of cheer to each day with a Marimekko Unikko shower curtain. 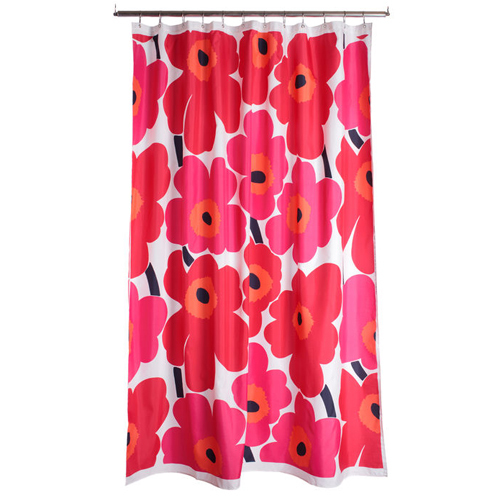 Please note: Marimekko shower curtains do not include shower rings and do not require a liner. Please Note: This shower curtain is slightly longer than standard US sizes. Now I have the sheets and the shower curtain too! The fabric is perfect. Dries really well and fast! I have a small shower door so I cut this in half and now have 2 shower curtains! Great! 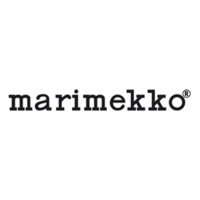 Love Marimekko! 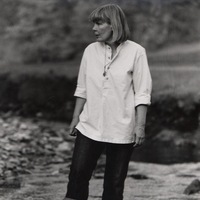 Thanks to Finn Style this wonderful brand is still alive! Love the vibrant pattern!! Makes the bathroom lively! Just love it! 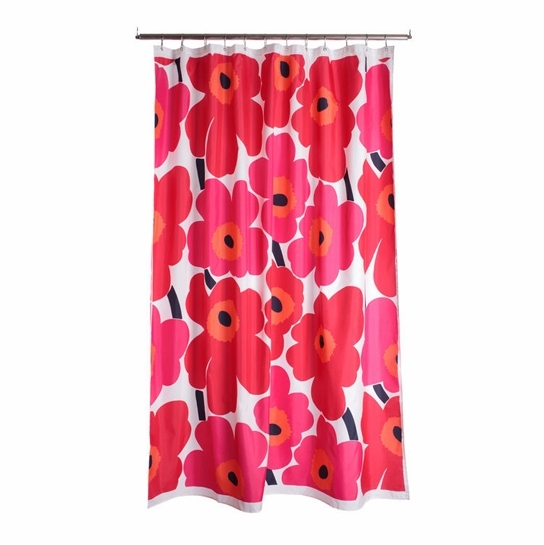 This Marimekko shower curtain is wonderful. Very bright and cheerful in a windowless bathroom. Although not required, I did hang it with a clear plastic liner. Very happy. I recently had my bathroom renovated and needed to find a shower curtain. I had been looking for a shower curtain that stuck me and this is the one that did! The colors are so bright and the length is perfect as my curtain rod is somewhat higher due to tall people in my family. I love Marimekko designs and am very happy with my purchase. Love the print on this- it is fun, stylish, yet still classy. I have it in my master bath and it is perfect. I live in an apartment that has a standard tub/shower combo BUT they hung the (permanent, non movable) shower rod extra high so the standard 72" length was too short. I had a heck of a time finding the standard width but longer length curtain. So glad I eventually found this curtain as I love it! ConsThey have a stamp down one of the sides that bugs me- should have been placed in the inside. Product is fine; I would have preferred the clear vinyl version I have used for many years but gather it is no longer available. The only problems with the present item are that it darkens the shower somewhat, and that since it is so lightweight it billows inward when the shower is on. Any recommendations for where to get the little magnets for the bottom hem that I have sometimes seen to deal with this problem? ProsReceived this shower curtain as a gift. love the print and that you don't need a liner. Consonly dislike is, it is too long. had to have it shortened to the standard 72 inch length. This brightens my day, every day. Who could walk into a bathroom with this shower curtain and not smile? ProsThe design and color of course but also the simplicity of it with no need for a liner and no outgassing from plastics! Blue Unikko Shower Curtain has so much character! I ordered this shower curtain in blue. It is perfect for my small bathroom because it gives it character and a happy burst of color that is not too girly (so my husband likes it too). The size of the Unikot (poppies) on it is perfect because they are not too tiny and "busy", yet they aren't so huge that it is difficult to make out the pattern. This shower curtain is durable as well. Beautiful shower curtain. Exactly as described. Arrived quickly. Very happy with this purchase. Absolutely love this shower curtain. It's bright, bold and modern. Looks perfect in my bathroom. Very cheery! I needed a longer shower curtain to cover up my TAN tub, and the length of this curtain is spot on! I purchased it in the gray color and it looks great. the shower curtain is made of great quality material, much better than your run of the mill ones. it also has transformed my yet to renovated bathroom into something that resembles a bathroom. Vintage graphics update the bathroom. Very attractive, gives excellent coverage, great color and vibrancy. Does this need a shower liner? It does not require a liner.